The striker’s game plan never changes on a general level. It revolves around the idea of controlling distance and not getting taken down while effectively delivering damaging strikes. A big part of the striker’s training for any fight, but particularly against the grappler, involves the idea of being able to get back to their feet. Assuming that they may get taken down at least once in the fight, they must have the requisite skills to escape the bottom position and return the fight to the standing position. Against the grappler, this is key from both the bottom and the top position. The grapplers main goal is to get the fight to the ground and find a submission or ground and pound victory. In this way, the wrestler and the grappler are very similar. A good way to think of the differences between them is that the grappler’s mind is set on the submission from any position. While the wrestler’s mindset, once already grounded, is on maintaining top position dominance and delivering strikes to his opponent. So, very generally speaking, the grappler will go for strikes but wants to find a submission, while the wrestler will go for submissions, but ideally wants to strike. Again, I must reiterate that these are only general ways to think about the styles and doesn’t apply to any fighter individually. The grappler and the wrestler both need to get a takedown but where the wrestler excels in the ability to take the fight to the ground, the grappler excels once the fight is there. This means the grappler would benefit greatly from having a very high level wrestling skillset in the match up against the striker. However, the grappler has more options. The grappler doesn’t lament being in the bottom position like the wrestler does. Although traditionally looked at as the losing position, it’s a fact that there are more submission opportunities from the bottom. The grappler may also specialize in sweeping his opponent from the bottom position to end up in the top position. This means he would only be taking the disadvantageous position for a few moments of the fight. Without sufficient wrestling, to get to the ground in the first place, the grappler might resort to what’s commonly called “the third option.” This is when the grappler aborts mid-takedown; which, if successful, would land him in a dominant top position, and opts to fall to his back, dragging his opponent with him and accepting the bottom position instead. All just to get the fight to the ground by any means necessary. This is also known as “pulling guard.” There are also some grapplers out there that will fake getting rocked by a big shot and fall to the ground, knowing that their overzealous opponents will immediately jump on them and try to finish the fight. Their opponent thinking that the grappler has been stunned, only to fall into the trap and get submitted shortly after. Fabricio Werdum is famous for this tactic. This is where the striker must be able to return the fight to their feet from any position, even a good one, when going up against a superior grappler. In many cases, strikers have been too eager to stay in a seemingly dominant top position in order to control the pace of the fight and edge out a decision win. Totally forgetting that they are in their opponent’s strongest skillset and are walking through a metaphorical minefield of submissions and sweeps. 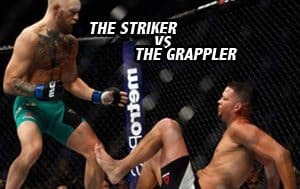 With those ideas considered, these are some questions to ask yourself when placing a bet on the striker versus the grappler. Does the striker have good takedown defense? How good are they at controlling the distance and staying out of clinches? How good are they at defending takedowns? How good are they at defending submissions and sweeps? Can they get back up to their feet from both, the bottom and top positions? Will they actually try and retreat to the standing position if their opponent opts for “the third option” and gives them the dominant- top position, or will they stay and fall for the trick and risk getting swept or submitted? Here are some questions to ask yourself when placing a bet on the grappler versus the striker. How good is his wrestling/takedowns? How good is his striking? Will he be able to, at very least, hold his own for a short time until the fight goes to the ground, one way or another? How likely is he to use “the third option” and pull guard on his opponent? How precise are his submissions versus the striker’s ability to defend them? What submissions does he typically win his fights by? If he typically wins fights by submissions that come from the top position and he’s fighting someone with superior takedown defense, he may find himself stuck in positions where he can’t find submissions without first sweeping his opponent. That begs the question, how good is the grappler at reversing the position on the ground? Some grapplers specialize in it, while others simply look for chokes from the bottom. If the striker in the match up has good submission defense and your grappler can’t sweep him, they may find themselves in a grappling stalemate which could result in a not-so-exciting decision win for the striker via top position dominance. These are just some of the basic things to consider when you have the general grappler versus striker match up. These general ideas are as black and white as they can be in a world which exists largely in the grey areas. A lot of fighters exist in a realm that’s extremely hard to define by the simple terms of ‘wrestler”, “striker”, or “grappler” and for those fighters, making predictions gets much more complicated. This is just a basic starting point to provide for you, a foundation of knowledge when betting on MMA online.